OK, just about every winter, I have discovered, I have this deep-down need to see something green., and start experimenting once again with SPROUTING. This year, the need coincided with our return from Israel, the end of shiva, and my intense need to rejoin the world through retail channels - particularly the soothing wholistic smell of organic and natural-food stores. Anyway. I needed The Smell and I needed To Sprout, so I hopped on down to The Big Carrot, one of my favourites, on Friday. I've been going there since I was knee-high to a grasshopper, thanks to Emily, a high school (and now Facebook) friend. 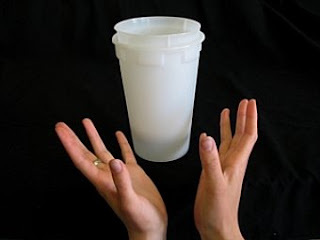 It turned out they only had one left of the sprouter that I wanted, but one was all I needed. I tried sprouting in baskets last year, with mostly success, however, the baskets - like everything else in this house - tended to go mouldy, so this time around I wanted something that could drain super-well and allow for fantastic air circulation. 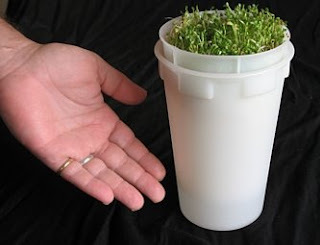 This sprouter, the Easy Sprout, is made of Space-Age washable plastic, seemed to fit the bill better than a basket, though I love the idea of basket sprouting (basically, the sprouts grow roots through the basket, which anchors the plants so they can't move around and grow stronger, more upright, and healthier). I tried it first with a bunch of mixed salad greens (the seed was from last year, but it seems okay still), but then this website basically says you shouldn't do it with greens... Oy. Anyway, they've got roots down now and some are starting to grow shoots. 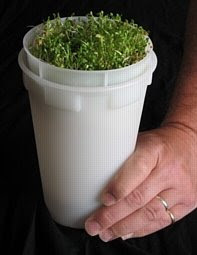 It's basically a jar sprouter, but with better air circulation at the bottom so sprouts are never sitting in their own runoff. Yuck. In the Green Living Things vein this week, I have also resolved to winter-sow a bunch of Columbine (Aquilegia) seeds I have lying around. They need to stratify (ie sit in the cold and damp) for a while, so this seems like the ideal season for it). But last year's winter sowing was totally undermined because of all the too-shallow containers I used. So I must find a nice, deep container and stick to planting one species in each container. Fw: New Rice Beverage packaging - thanks!